Contrary to popular belief, caring for your pet requires a lot more than food, water, and love. This is particularly true in the case of small dog breeds that are more prone to sickness or allergies. To take care of your dog’s health and wellness, you must treat them with kindness and patience. Small dogs such as Maltipoos, Chihuahuas, and Yorkies aren’t as common as a Labrador or Golden Retriever, which means information on these unique breeds isn’t always readily available. But that’s okay! 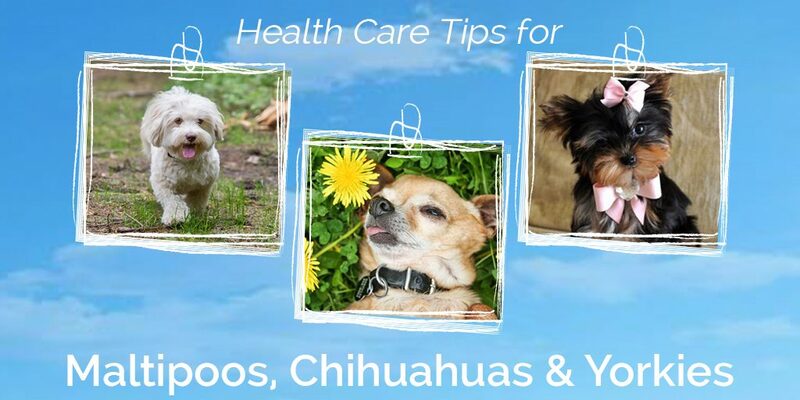 Today we’re going to discuss the diet and health needs of these adorable breeds. Often referred to as designer dogs, Maltipoos are a cross between a Maltese and a Poodle. They grow up to approximately 14 inches in length and can weigh between 5 and 15 lbs. They have a silky, soft coat that can be straight or curly. These little dogs are not considered to be purebred but make excellent family pets due to their temperament. While the Maltipoo is not a watchdog in the slightest, they get highly attached to their humans and won’t pass up a chance to show affection. This breed is good with children, cats and other pets. They require plenty of socialization and can be easily trained with some amount of experience and patience. 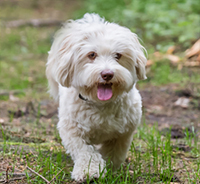 Maltipoos are highly active dogs, known to be expert runners and jumpers. Since these fur balls are so active, just taking them on a daily walk is enough to keep them healthy. Despite having a thick coat, the Maltipoo doesn’t shed a lot. Maintaining their fur should be no problem at all. Maltipoos need to be kept on a diet specially formulated for small breeds. You should feed them only high quality, dry kibble as it helps in preventing a variety of oral problems. 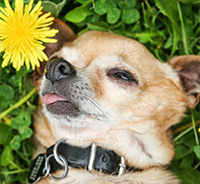 Without dry kibble, they might develop gum infections, experience loss of teeth, and have bad breath. You should also ensure that your Maltipoo pup is eating the right amount of food at the right time. They need at least two meals per day to stay well fed and healthy. Treats should only be used to encourage and reward good behavior. Click this link for more information and some suggestions on what dog food brand to feed your Maltipoo. Chihuahuas are comically entertaining, loyal little dogs that are just brimming with personality. This breed might be small, but they aren’t any less capable of going toe-to-toe in dog competitions with their larger cousins. The Chihuahua’s temperament comes mostly from their parents and grandparents, so checking their history before adopting is a must! Chihuahuas are known as the smallest dogs in the world (weighing between 3-6 pounds), they are extremely variable in both looks and mannerisms. Most of the time, they like being close to their humans and love to follow them around. Apart from being highly affectionate, they are intelligent creatures and fast learners. Chihuahuas are generally distrustful of strangers, so you should train your puppy to behave and socialize accordingly. They can also be unfriendly towards other dogs and pets if not socialized from a young age. These dogs are not the best choice for homes with small children as they are fragile and the toddler may hurt them unintentionally. Your dog’s health is highly reliant on what you feed them, how often you feed them, and in which manner their food is presented. Chihuahuas tend to burn calories faster than larger breeds, and their needs in regards to physical activity and diet changes as they grow older. These dogs have a low tolerance for artificial coloring and preservatives- avoid them at all costs. The right balance of healthy fats, proteins, and essential carbs are necessary, but you may have to experiment a bit to see what food best suits their digestive system. Always provide the most nutritious meal you can afford, including raw food like chicken meat, bison, venison, and fish. Complex carbohydrates coming from brown rice or sweet potatoes are needed as well. Yorkies happen to be the second smallest dog in the world. According to the AKC they weigh around 7 pounds. There are two conflicting opinions about this breed. Some say that Yorkies are vigorous in temperament while others say that this is a toy dog that’s only made for hugs and cuddles. The reality is that Yorkies grow up to behave the way you trained them to. One thing’s for sure – this breed of dog is naturally inquisitive and a quick thinker. They are energetic and prefer to spend time dashing around to check things out. This adorable breed can coexist with other pets with the right training but have the tendency to be overwhelmed with the behavior of mischievous children. One of the most attractive features of a Yorkie is their beautiful blue and tan coat. 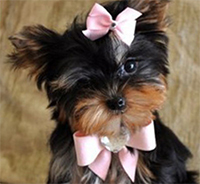 In their younger years Yorkie puppies usually have black fur, which changes color as they grow older. The ideal show dog weighs between 4 to 7 lbs but can go up as much as 15 pounds when fully grown. One of the most crucial elements of keeping your Yorkie healthy is related to what, when, and how you feed them. The food you feed your pup will not only affect their physical health but also affects their mood and behavior. The amount of food this breed needs depends on the specific dog’s activity and their age. Because of Yorkies’ small size they have sensitive stomachs. It is best to give them 2-3 small meals every day. Scheduling meals is always a good idea and leads to better behavior. Snacks are allowed, but only to reinforce good behavior. While natural food is always best for dogs, you may feed your puppy manufactured food only after reading the label and considering the ingredients. Click this link for more information and some suggestions on what dog food brand to feed your Yorkie. Being a dog owner is a huge responsibility, and it’s only right that you treat your furry friend with the respect and love that they deserve. Food plays a huge role in the health of any dog, which is why you must make sure you feed them high quality food. If your dog experiences any side effects such as itching, vomiting or other odd behavior, don’t hesitate to contact your vet.